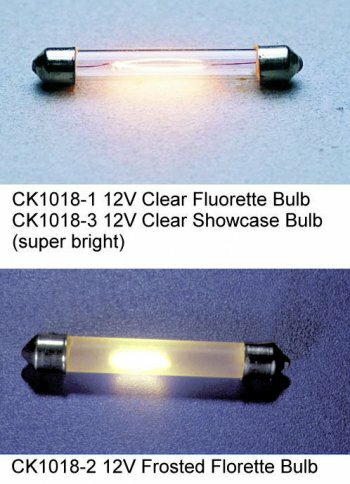 Ideal for back lighting or illuminating miniatures, these fluorescent shaped bulbs provide a unique and effective indirect lighting source. Available in either frosted or clear tubular glass. The frosted bulb gives a uniform and diffused light over a large area whereas the clear bulbs display a brighter and more localized illumination. Fuse-type snap-in/snap-out construction allows easy bulb installation and replacement. Each bulb measures approximately 1/4" in diameter by 1-1/2" in length. Power consumption for the CK1018-1 and -2 bulbs is 70 to 80 ma when connected across a 12-volt source. The extra-bright Showcase Bulb draws approximately 220 ma of current. All fluorettes are warranted for 3,000 hours when used with a Cir-Kit Concepts' 12-volt transformer. Mate with CK1019 and CK1019-1 sockets. 2,500 hour bulb life.